Using DMI’s 30% concentration ice as the measure of extent, 2015 was the shortest melt season on record in the Arctic. Ice peaked around March 25, and bottomed around September 3. The melt season was abut three weeks shorter than average. The drop in extent during the second week in August, was due to cold winter storms breaking up ice in the Beaufort Sea. 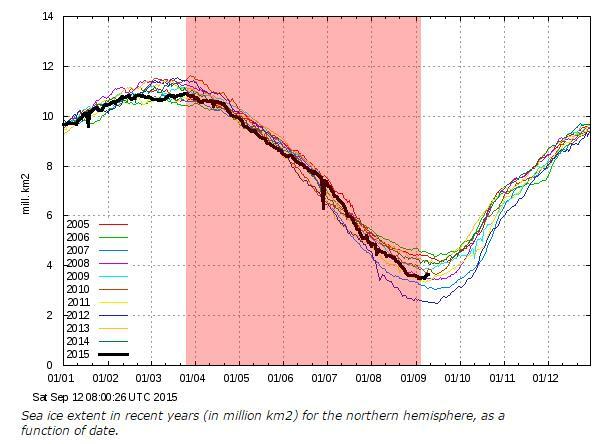 This made alarmists very happy, because it gave them a small excuse to lie about Arctic temperatures. Heidi Cullen is engaged in her standard spectacular climate fraud today. Like she always does, Heidi cherry-picked a cold year in the 1970’s to start her map. But if we look at the entire US temperature record , we see that there has been no increase in autumn temperatures for 115 years, and that Heidi started her graph immediately after a large drop in temperature. Heidi is intentionally misleading her readers, and engaging in fraud. 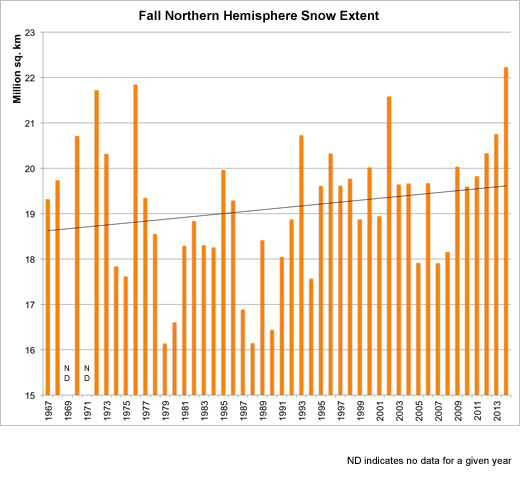 The last three autumns have seen record snow and cold in the US. Obama’s climate falsehoods and flagrant lies, designed to grab power and money – your money. Good article here, forensically exposing Obama’s latest alarmist change change lies. Recently, President Obama visited Alaska to scare up support for his climate agenda. But it’s becoming clear that this agenda is not, in fact, about climate. Instead, it’s the typical Washington story of power and money—other people’s money. In a bit of bonus irony, the climate research center at the University of Alaska shows that there has been no warming trend in Alaska since 1977. In fact, the trend is slightly negative.